A few Saturdays ago saw three teaching staff, a head of House and 73 parents, carers & Year 11 students (with a sprinkling of Y10s and 12s) come together for an afternoon of intense ‘How To Revise’ workshops. We had a list of less than 20 sign-ups on the Friday but decided to go ahead with the day irrespective of the number. As it happened, car after car, and family group after family group trailed up the drive and we were having to unpack more biscuits and serve more teas and coffees than we had dared anticipate. But, without question, it’s also ours. Our intake of students and family circumstances is wide and varied. Many of the parents didn’t go on to higher education themselves so feel very much in the dark when it comes to knowing what to do and how to encourage their child’s exam preparation. Even those who have, sense that education – and exams – have changed so much since they did them that they’re unsure whether their experience is still relevant. So – this is how the day was organised. The session was scheduled to last for two and a half hours. 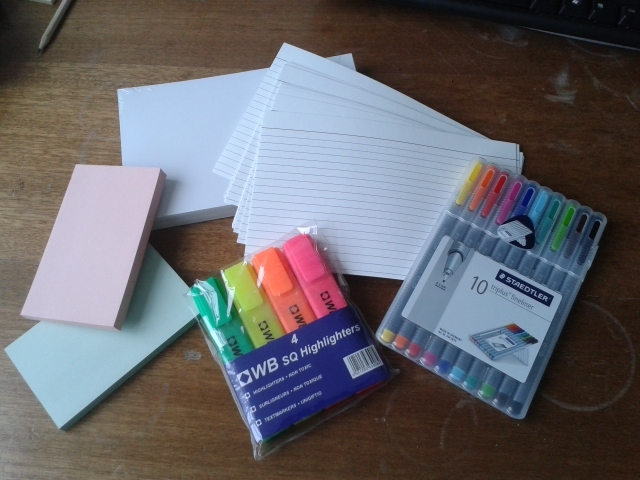 The first half hour, serviced by refreshments, gave a chance to distribute a ‘Revision Equipment Pack’ to each student – highlighters, post its, colour pens, packs of blank cards…. ; an investment we have found from previous experience pays itself. It was also a chance to urge those collected to see the revision process as something that should involve all three groups in the room: students, parents and staff. Students were encouraged to share with parents the revision they were doing, use them to check sections were being learnt, and keep them informed as to how it was going. Parents were urged to get involved, to offer time and help and aim for that fragile balance between encouragement a nd enforcement. We’ve seen (heck, we remember it ourselves) the stress and tension that can build in households in the months, then weeks before exams. The message was: there will be stress, there will be anxiety; it will be on both sides – so anticipate it and do whatever you can to set up routines, expectations and lines of communication to ease its passage. 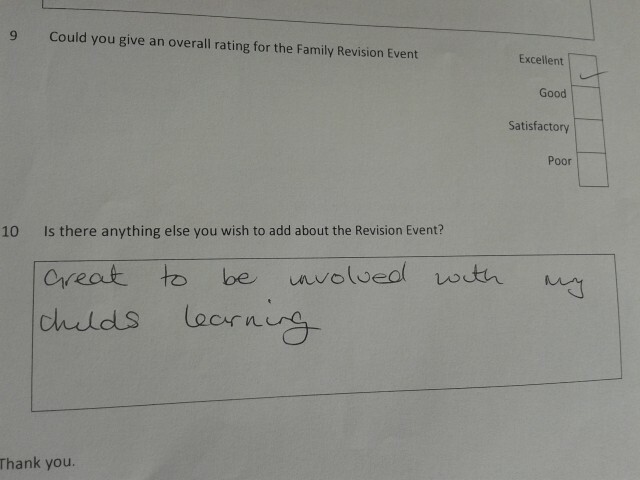 We’d trialled a smaller event previously and held workshops for students separate from those for their parents/carers. This time, in response to feedback, we kept family groups together – and a much better decision. Three 20-minute workshops took place simultaneously for groups of 20-24 parents and students, repeated twice over the hour with groups moving between teaching rooms. The cycle was then repeated for each teacher’s second workshop theme. There were some evaluation comments that said this was too short a time and longer sessions would have been appreciated, whilst others liked the short, punchy transitions. This workshop emphasised not just the importance of starting early, but of interleaving (or spacing) the revision process. A bit of cod neuro-science featured to illustrate how memory is created in the synapses between neurons, and strengthened by revisitation. The distinction between short-term and long-term memory was prevailed upon to suggest that effective revision moves the revised material from the former to the latter. 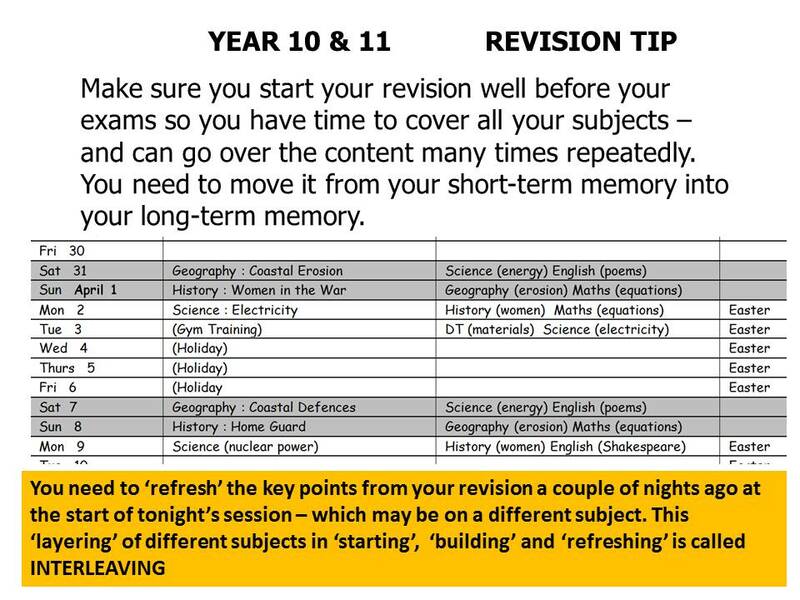 This means good organisation in a revision programme of returning to previously-learnt sections every few days. Students were given an A3 revision calendar to mark in one column days they would not be able to revise, another column for main revision topics for a night/day, and a third to identify which topics would be interleaved as quick refresher starters to sessions. A session that put the boot into the impression held by a number of students that ‘just reading through my notes’ is actually revising. It’s a frequent frustration of parents that when they ask their daughters/sons what revision they’re doing, they’re told: ‘It’s fine – I’ve spent an hour reading through my notes’. It raises suspicion and generates anxiety that, actually, not a lot is being achieved. This workshop put the lie to that as a technique and emphasised the need to manipulate the information as received into a different, learnable form. Diagramatic, use of symbols, spider diagrams, mind-maps, bullet point lists, post its, flash cards, audio recordings….. various options to turn what has to be learnt, into a format in which it can be memorised. 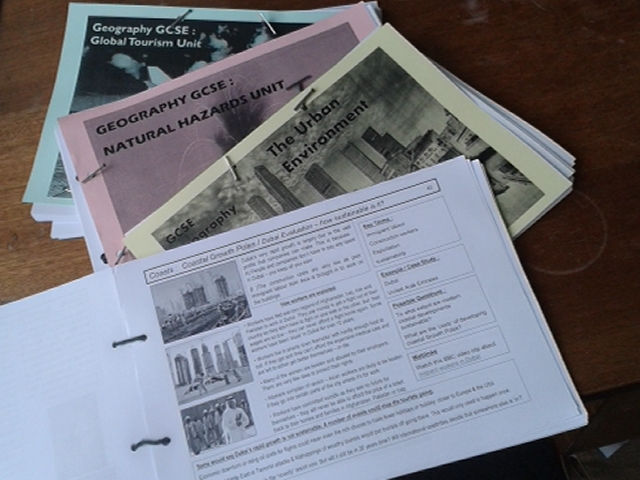 Students have to process their classnotes and revision guides into a format that concentrates the essentials into easily-revisited summaries of key information. This workshop showed how a page of text notes could be broken down to be classified under key headings, rephrased to include the essential and dispos e of the packaging, colour-coded to classify key concepts or sequence trails of information, and the reverse side of the card used for key vocabulary and possible exam questions. The skill is in making the flashcard embody fully the key information that could be called upon and organising it in a manner that aids recollection and meaning. A technique that, while familiar to many students, was new to many parents. Examples of organising information via mind maps for different subjects were presented to show how various subject elements could be summarised on one large sheet. This is a bit of a marmite technique – I find them really useful when planning and revising but they do nothing for my daughter. (Her frustration at a teacher who insisted they were THE way to revise when she was doing her GCSEs still resounds. She is a ‘lists’ person). To test out whether this was a technique that might be useful, or otherwise, attendees were challenged to remember a grid of 20 words, and then 20 images to see which they managed more successfully (leading to the savoury evaluation comment by a student asked for the best bit of the day: “….watching my dad under pressure!”). •P Preview – Read through chapter and section headings. Read the final summaries. •S Say – Say your answer and explain your keywords aloud to yourself or explain to someone else. •T Test – Go over the questions and test yourself again days later – what can you still recall to answer each of the questions that you wrote? With the ease of accessing past papers from exam board websites this workshop showed how they, and the associated mark schemes, can be a useful tool in both guiding the revision programme and assessing the extent to which whatever style a student has gone about it – has proved effective, or otherwise. We have found, in the past, that students can convince themselves they are revising hard, but when put to the test (literally), it isn’t effective revision that they have pursued. Students are encouraged to start early on checking whether their chosen revision method is doing the business and enabling them to decipher the exam-speak of questions, recollect appropriate material, to sufficient depth and breadth for the mark allocation, and able to think flexibly with response format and structure to capture the full set of marks on offer. Parents, particulaly, valued the chance to see where to access exam scripts and understand what their children will face in the summer. It helped clarify for them the amount of revision that would have to be undertaken on a subject by subject basis and realise how early the programme would have to start. (To the parent who clearly ‘lobbed’ the question: “Would you say that one hour of revision, and two hours on a play-station each night is getting the balance right?” for it to be belted back firmly into the required zone, spoke volumes for the value of triangulation between the three parties in the room. The sheepish look on his son’s face said the message had been absorbed). 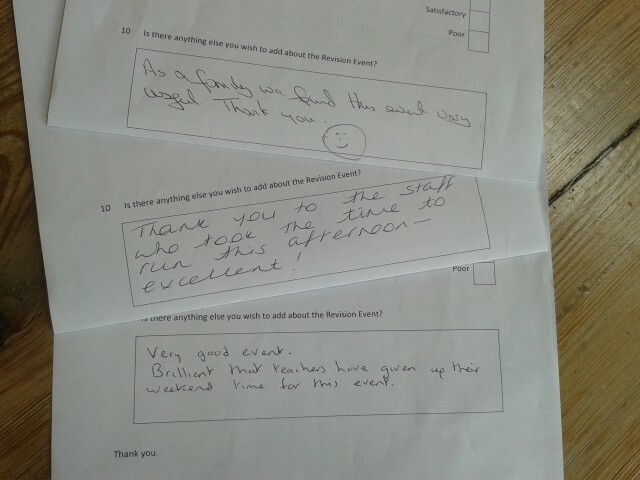 After what became three hours, we asked for evaluation forms to be completed and were delighted by the comments. The afternoon had met a real need and those attending were so appreciative of the information and guidance. It was lovely to see families working together in these sessions, but equally rewarding to see students who had come along on their own, or parents & carers who were without students but felt enabled by the information they could take back to make an active partnership in preparing their child for the events to come. consolidating and organising each course of subject notes into a coherent and complete library. 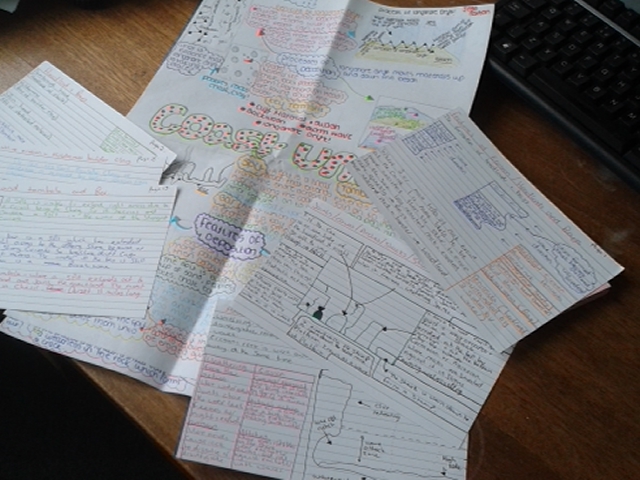 constructing the body of revision essentials to be committed to memory. learning it through interleaving with sufficient time to cover everything. applying it by self-test, parent-test and successfully completing exam questions as checked by mark schemes or teachers. It would also have been useful to take contact details of the parents who attended to carry out a follow-up survey a few weeks after the session to see how the programme was going in their household, answer any questions that had arisen and offer on-going support. In the light of the day, the three teachers delivering the workshops visited all Y11 tutor groups in tutor time to deliver a summary of each workshop so the full year group got to hear the message. We need to build this is at the planning stage for next year. It also raises the question of whether this should be a Year 10 experience – developing their revision habits during the first year of a two-year course, or is it more suited to the second term of Year 11 when the imminent prospect of ‘the real thing’ ensures it has more impact and traction? There are also implications for subject departments that may need addressing: do students have a complete set of notes from which to revise? Is it just class-notes, and are they in an easily revise-able form? Are there effective commercial guides – and who pays for these? How are students catered for who may have missed p ortions of the course through extended illness or arrival from other schools part way through the course? Are subject areas able to produce in-house revision summaries that cover the essentials? With departments gearing up for new exam courses in one or two years’ time, how can the revision needs be planned for in advance – and what provision exists for legacy courses? We expend innumerable hours discussing the quality of teaching, the most effective pedagogy, how students learn… as we should. But there are strategies we can extend and interested parties we need to include if the learning -and then, remembering, – is to have full impact in exam achievements each August. Keeping it in the family – that immediate one, and the community family that exists between home and school, should mean time, resources and planning are devoted to it in a proportion related to its importance. It’s ‘very’ important.